Today was national "I Can Be" day in Canada. I Can Be day was dedicated to inspiring young girls to dream big with help from their mentors. Participating schools had moms come into the classroom and speak about their careers. The idea is to inspire our daughters to be whatever it is the want to be - whether that is a doctor, lawyer, teacher, engineer, stay at home mom (like I was for years) or work at home mom (like I am now). We want our daughters to be stronger, smarter, happier and more fulfilled! Established as a podium for girl empowerment, I Can Be The Voice™intends to provide today’s parents with the tools they need to encourage their daughters to be their own best advocates; to help them realize the scope of their inner potential. Here, you’ll find relevant, constructive dialogue around some of the most pertinent issues faced by girls today. Search. Share. Speak your mind. Because every time you find your voice, you help a girl find hers. I have been blessed to know many inspiring women over the years and I'd like to tell you a quick story about one of them. In grade 6 I had a truly amazing teacher. I was a good kid but I was convinced that I was not very smart. I was a thoroughly average student. C's all the way. I was rather shy and terribly nervous. My anxiety levels were just crazy sometimes and I was pretty convinced that I could, in fact, NOT be all I wanted to be. One day my mom and my teacher were having a parent-teacher interview and the teacher called me in to join the meeting. No word of a lie I thought I would pass out from fright. I was absolutely certain that I had done something terribly wrong or that I was so stupid they were going to make me go back to grade 5 or something equally horrific and life as I knew it was about to end. My stomach filled with dread and I went and sat down with my mom, facing my teacher. And what did she do? She smiled. And then she told me I was smart. She told me that she KNEW I could do better because I was intelligent. She told me that I was so smart that I could be getting straight A's. She told me she believed in me and she said it all right in front of my mom! Now don't get me wrong, my mom had told me all those things about a zillion times... but coming from my teacher somehow made the difference. It clicked. I got finally got it- I COULD do better! I was smart! And you know what? From that moment on, for many years, I DID get straight A's. All because that wonderful teacher invested in my life. I hope and pray that there will be many women who inspire my daughter throughout her life. I hope that other women will tell my daughter the affirming things I have told her a million times - and that she will HEAR them and believe that she really can be the woman she wants to be. I loved playing with Barbie when I was a little girl and my daughter is no different. Olivia loves her Barbie dolls and in fact has asked for a dollhouse for them for her birthday this year. I love that Barbie has evolved over the years to include all sorts of careers. Little girls can see Barbie being everything from a mommy to a veterinarian. 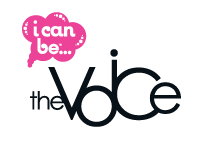 As part of the Barbie I Can Be campaign there is a brand new website called Be The Voice. Each month there will be a new theme and great parenting tips from Canadian Parenting Coach Terry Carson. Being a mom is a tough job and we can use all the help we can get!